Flames winger Andrew Mangiapane decided that the best time to show Calgary he was worth calling up on the last day of 2018 was in Game 1 of his team’s series against the Colorado Avalanche. 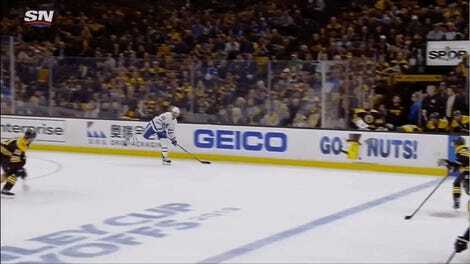 With less than six minutes left in the second period, the 23-year-old was able to deke his way past three defenders, toy with Avalanche goalie Philipp Grubauer and score on his knees for his first-ever postseason goal in his first-ever postseason game. As if making the entire state of Colorado do an impression of that Alonzo Mourning gif of reluctance acceptance wasn’t enough, Mangiapane was even able to make his goal stand out much more without even really trying. Not bad for a guy whose last name translates to “eat bread” in Italian.